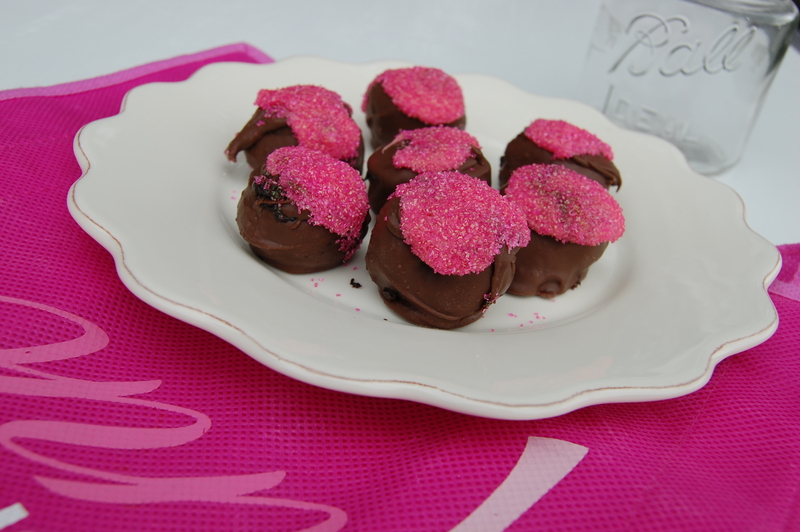 Raspberry Oreo Truffles- And one last reminder about Breast Cancer Awareness! I was looking for a way to wrap up a successful Breast Cancer Awareness Month and stumbled upon this recipe from the Mod Housewife. Brilliant! I have to say- it is hardt to go wrong with Oreo’s, not to mention I had half of a pack left from some cupcakes I made a couple of weeks ago. These are super fast, really easy and fun for the whole family to get involved in! Mix cream cheese, Oreo’s and raspberry jam until well blended. Chill in freezer for 15 minutes then scoop into 1 inch balls. Place back in freezer and melt chocolate, following package directions. Remove balls from freezer and dip into the melted chocolate, placing on wax or parchment paper to set. Decorate as you wish, I melted a bit of white chocolate and added a couple of drops of pink food coloring. Topping the truffles with a bit of the pink chocolate and then dunked them into pink sanding sugar. The same could be done with any color or even a simple white chocolate drizzle. Whatever’s clever- more fun the better! Raspberry Oreo Truffles- Messy but delicious! 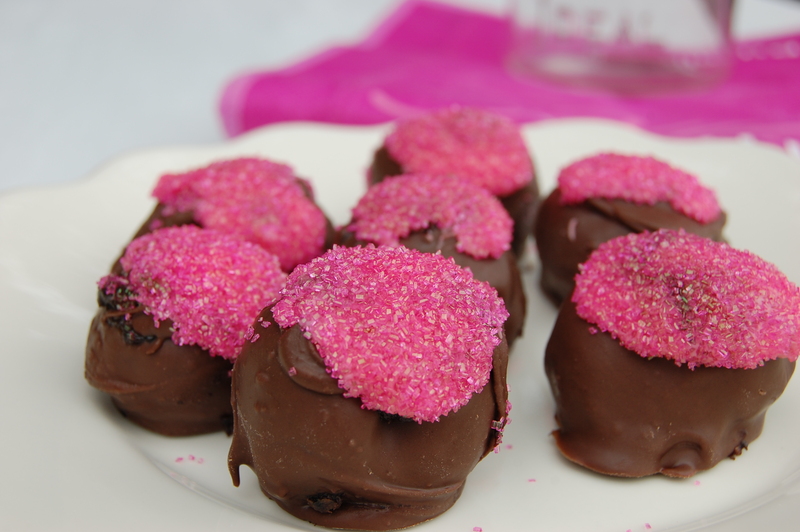 Raspberry Oreo Truffles, one is good, but two is better! Enjoy! And remember to get your check ups! 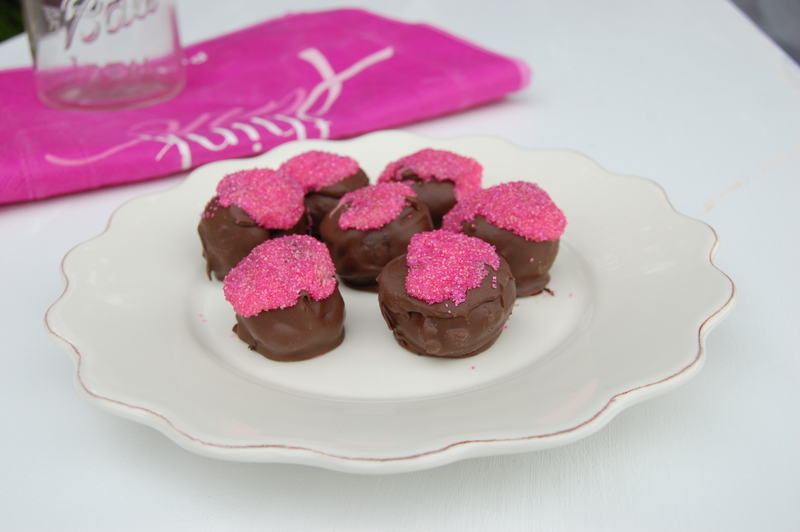 This entry was posted in Cookies and tagged Breast Cancer Truffles, Raspberry Oreo Truffles. Bookmark the permalink. ← Candy Corn M&M’s and Pretzel Blondies! Gotta hide the few that are left. MINE! MINE! Stunning colors! Thanks for dropping by and visiting, glad to read more of your blog. You just made Lauren a very happy little girl. I have absolutely GOT to try making oreo truffles. They’ve been on my list for so long, but I never got around to it. Well done, they look fab!